Why is SK mentioned as prime bidder of Asiana Airlines? With the nation’s second-largest flagship carrier now up for sale, speculation is rampant as to who will acquire Asiana Airlines, with the unlikely candidate SK Group -- a telecommunications-to-chips giant that has no business experience in transportation -- emerging as a potential dark horse. The nation’s third-largest conglomerate has so far denied all rumors it is interested in acquiring the heavily indebted air carrier. But market analysts continue to point at its sizeable capital resources, mainly generated from its semiconductor arm SK hynix, and its fundamental growth strategy through mergers and acquisitions. “If SK Group acquires Asiana, it will become the second-largest conglomerate by assets, and also can raise its business profile as the operator of Korea’s flagship carrier,” said Park Ju-geun, head of local corporate tracker CEO Score. The cost of acquiring Asiana might be around 2 trillion won ($1.76 billion), but it would have to take the risks of operating an air carrier already struggling with 7 trillion won in debts and falling profits. “The size of the deal is not big for SK Group, but when looking at its financial status, it can be poisonous (to its portfolio),” said an industry insider who declined to be named. According to multiple reports, the group has been interested in acquiring Asiana since last year when it hired former Jeju Air CEO Choi Kyu-nam as vice president for a newly launched global M&A division under its decision-making council Supex. 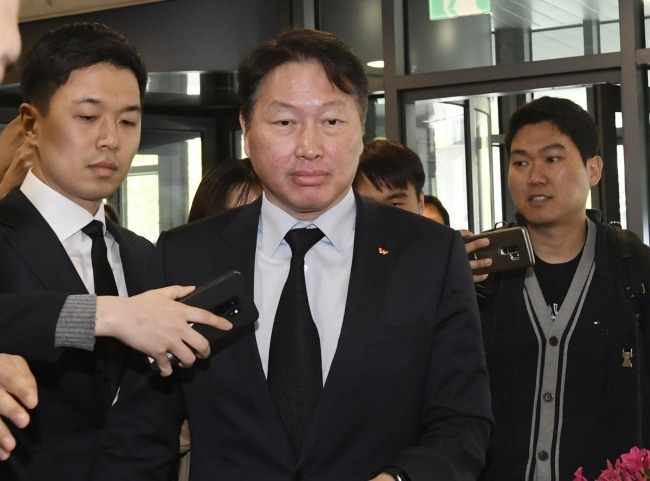 The company has denied such reports, saying it hired Choi only because of his expertise in global mergers and acquisitions, not because of his previous position at the budget airline owned by Aekyung Group. Aekyung is among other potential bidder being mentioned, along with Hanwha Group, which has an aircraft engine manufacturing unit, and CJ Group, a retail giant that owns a global logistics business. Private equity funds are also keen to acquire Asiana, but the acquisition process can be trickier for them, as it requires approval from the Transport Ministry. Private equity funds may have to consider forming partnerships with strategic investors rather than taking on the management alone.